Sherry Trifle! Something for Burn’s Night. Although I and my Official Taster love Haggis (he being part Scottish) this recipe for a dessert is also traditional. 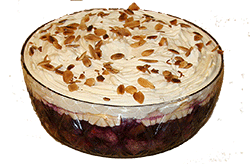 Although I am not a great fan of trifles in general, this is a truly tasty version. Mix the sherry and the brandy and sprinkle evenly over the sponge allowing it to soak in. 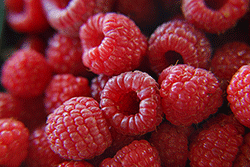 Add a layer of raspberries. To make the custard, whisk together the egg yolks, sugar and vanilla essence until pale and creamy. Once it is well blended, return to the pan and stir continuously over a low heat until the custard thickens. When quite cool, pour the custard over the layer of fruit, spreading evenly.